Here is another magazine subscription freebie from Rewards Gold. Simply fill out this short form about your MP3 player and you will earn a one year subscription to Sound & Vision Magazine (a $12 value). 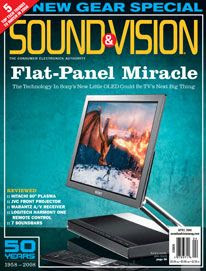 Sound & Vision Magazine covers just about everything as far as home entertainment goes. This is an easy freebie to get for yourself or as a gift for someone else in your life. Click here to find more magazine subscription freebies I recently posted.